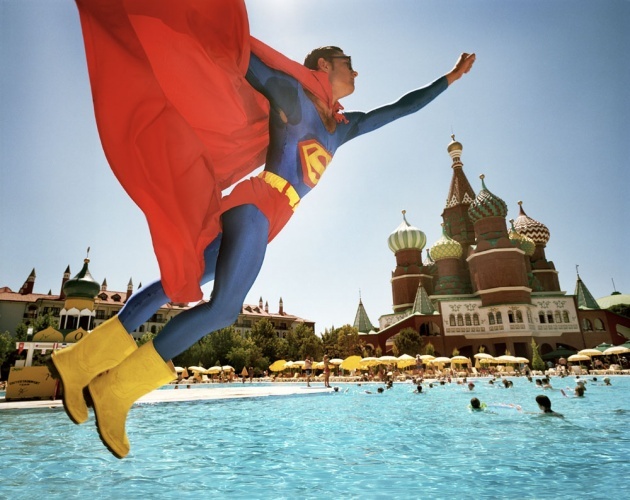 In 2004, Austrian artist Reiner Riedler began a documentary project of photographing the environments and inhabitants of theme parks around the world. Fake Holidays transports viewers to the artificial landscapes of leisure destinations as varied as Florida, Turkey, and China. Riedler’s vivid images starkly illuminate the incongruities of tourists visiting sites such as a “tropical” resort near Berlin, an indoor ice-cave in Dubai, and the Star Trek Experience in Las Vegas. His photographs shed light on how today’s consumer culture allows for fantasy to become reality in such extreme places.